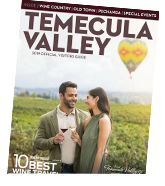 Temecula is centrally located within Southern California, with a short drive from all major cities including Los Angeles and San Diego. There are numerous international airports all less than one hundred (100) miles to Temecula Valley. Ontario International Airport (ONT) - 35 miles east of downtown Los Angeles in the Inland Empire. Located between I-10 Freeway on the north and the SR-60 Pomona Freeway on the south. Ontario is located 53 miles from Temecula. San Diego International Airport (SAN) - northwest of downtown San Diego, California. The airport has domestic flights and also has nonstop international flights to Canada, the United Kingdom, Mexico, and Japan. San Diego is located 57 miles from Temecula. John Wayne Airport, Orange County (SNA) - the only commercial service airport in Orange County, California. It is located approximately 35 miles south of Los Angeles, between the cities of Costa Mesa, Irvine, and Newport Beach. Short drive to Temecula, 66 miles. Los Angeles International Airport (LAX) - is the seventh busiest airport in the world and third busiest in the United States, serving more than 74.9 million passengers in 2015. LAX is located 92 miles from Temecula. Palm Springs International Airport (PSP) - is served by ten airlines that connect to hundreds of cities worldwide. Temecula Valley Airport (The French Valley Airport) - located in Southwest Riverside County, adjacent to the communities of Temecula, Murrieta and Winchester. McClellan-Palomar Airport in Carlsbad is a gateway to and from San Diego’s North County.